March 3, 2018 The Water Engine. New Design to overcome the Prior Patent's Patent Examiner's Objections. To Build aVortex Force Reactor simply purchase one each of the above four items and follow these instructions. You place the return pump in the bottom chamber and run a long piece of tubing through the hole in the bottom tank up into the top Vortex Chamber. Seal the hole with Silicone Glue. Let the tube drop down into the Vortex Chamber and wrap around the bottom of the Vortex Chamber three times. You will need to place a hole in the white strip between the two chambers through which to insert the return pump electric plug cord. To start the reaction you fill the bottom tank one third of the way up. Then you plug the hole in the top Vortex Chamber and fill with water. Pull the plug and immediately start the return pump. A Vortex will form and you will have a beautiful creature to gaze upon. The Water Engine. The World's First Mass Market Perpetual Motion Machine. It produces electricity and can earn cash for its owners. For the answer to the Mensa Test please see latest Go Fund Me Update. In order to keep the progress I have made in getting to this point it is time to build the working reactor that I've promised. In order to do this I've set up a Go Fund Me Campaign to raise the necessary funds. Please help by clicking on the link below and contribute what you can. I may actually have to show the patent examiner a working model to get the patent. All funds will go toward building and demonstrating The Water Engine. As of March 13, 2018 I have raised $20.00 of my goal. So I have decided that either people think I am nuts, stupid,or not God. in response to this decision I am going to give you the answer to the Mensa Question. You will see the problem in the Go Fund Me description. For the solution to the problem please read the whole description then see the latest update for the solution. After all of that, if you think that this knowledge is useful you, please make a donation so that I may build the reactor and hopefully help make us both some money and save all of the 1.6 billion people now living on Earth with no electricity at all. The Water vortex has fascinated scholars world wide for centuries because of its beauty and power. known as the Electric Pet. It not only looks beautiful it also produces electricity. the beauty of the vortex and you can see why the Perpetual Electricity Turbine is man’s next best friend. The Vortex Force is the same force that is responsible for the creation of Hurricanes and Tornadoes. It's proper name is the Coriolis Force. Many people are currently trying different ways to capture this power to make electricity. The Vortex Force is also a group of men and women who are working to see to it that this promising technology is spread around the world. All of that sounds nice but means absolutely nothing until we have a working model to show for our efforts. That is the purpose of this web site to record the process that we go about as we try to build a working model of a PET Vortex Force Reactor. To record the progress of our efforts I will be blogging below as well as posting new videos of the steps we take to bring the world's first PET Vortex Force Reactor into the world. A lot has happened since starting this site. 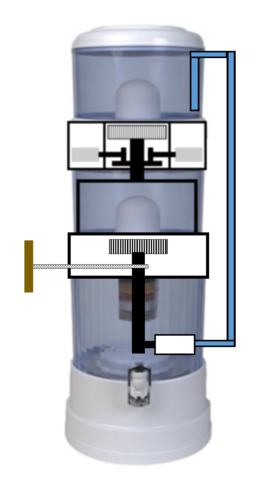 We have built a reactor and sustained a vortex for months at a time using the Zen water purifier body. We have registered a patent for the Perpetual Electricity Turbine that will convert the power of the Vortex into electricity. According to Buckminster Fuller it is better to use products that are already made than to start building the same thing over again. In light of Bucky's thoughts I have decided that it would be better to design the Perpetual Electricity turbine to fit within the Zen Water Systems Vortex Force Reactor Body that we already have. It will require a bit of challenge but it also narrows down some of the design elements. I am aiming to get four kilowatts from the machine using four one kilowatt high speed generators. This means building an insert to go between the two chambers of the Zen Reactor Body. You can see a mock-up of what that will look like at the top left of the page. The next thing to do is to build an insert for testing purposes. I'm Staying Alive. They killed everyone who was on the Grassy Knolls at the time of John Kennedy's Assassination. What makes me think they wouldn't kill me and the few people who have seen the invention until now. Or at least they don't know where you are. So, as the sole beneficiary of The Trust in God, I, Gregory Stuart GOrDon, now let you in on the secret patent information. I trust that you will at the very least give me 10% of everything you make by using the idea. Trust. Here are the economics of the machine. At 180 dollars for the two Zen Water Filters we could spend $500 dollars on the insert for a total cost of 680 dollars. At 72 dollars a month in income from one kilowatt of electricity it would pay faor itself in less than 10 months. The motors are on Ebay for about 15.00 dollars apiece. They produce .25 kilowatts a piece. Four of them would make one kilowatt. And they can be arranged in rows around the turbine eight or more at a time. The original patent application for the PET Vortex Force Reactor was abandoned on Oct 7th of 2017 due to design defects. After speaking with the patent examiner it became clear that the USPTO was not yet ready for a perpetual motion machine without a total new understanding of how the laws of thermodynamics apply to the machine. As a result of those talks I decided to redraw the whole machine and came up with a new turbine, Vortex Chamber and process that should pass muster without too much conflict. I also added language to this new patent application that should satisfy the examiner's blanket contention that any perpetual motion machine of any kind could never be built. As a matter of fact perpetual motion is the rule net the exception once one applies the laws of outer space to the workings of the machine. The controlling law of physics is that a body in motion tends to stay in motion. In the new Water Engine the flow of water is sped up by the vortices in the machine and turned into energy by a new car air filter shaped turbine that surrounds the now extended vortex chamber. In order to raise funds for the building of the first prototype I have published a short paper that I am selling for less than five dollars that explains the whole process including the new physics. Time to do the math. 10,000 years of math. Starting Now. Our first mathematical problem is this. How do we make the world work for 100% of humanity without environmental harm in the shortest possible time. The answer is by fully funding all of the finalists of the Buckminster Fuller Challenge to the tune of one million dollars a piece. It is not only the fastest way but the cheapest way. THAT IS OUR MATH PROBLEM FOR TODAY. For more math please continue to visit this site. I will be working out our problems right here. I finally got a picture of how we are now tapping the Vortex to generate electricity. In the video you will see a generator mounted on top of the Vortex Force Reactor Body. That was not efficient. Now we are going to tap it from the bottom using The Perpetual Electricity Turbine. Below is a picture of how the turbine works. As you can see this method of getting electricity out of the vortex is totally different than that shown in the video. Now the plan is to build an insert that fits between the Vortex chamber and the bottom tank using the same Zen water purifier body that we used in the video. High speed generators that are about the length of a cigarette are available from China at very low cost. These produce about 500 watts of electricity. Using four of them on the turbine will net us two kilowatts of electricity from one Reactor. Pre-production Vortex Force Reactor Kit. In a recent conversation with the friend from whom I acquired the name Perpetual Electricity Turbine or PET we discussed how interesting it would be if students could build there own Vortex Force Reactors even with out it producing electricity. So, I decided to make that possible by placing links to the same items that I used to build the one in the video along with basic instructions. You place the return pump in the bottom chamber and run a long piece of tubing through the hole in the bottom tank up into the top Vortex Chamber. Seal the hole with Silicone Glue. Let the tube drop down and wrap around the bottom of the Vortex Chamber three times. You will need to place a hole in the white strip between the two chambers through which to insert the return pump electric plug cord. To start the reaction you fill the bottom tank one third of the way up. Then you plug the hole in the top Vortex Chamber and fill with water. Pull the plug and immediately start the return pump. A Vortex will form and you will have a beautiful creature to gaze upon. In accordance with the teachings of Buckminster Fuller where he tells us it is better to take parts off the shelf than to start from scratch. I have decided that this Zen Water Systems water purification system will be the standard reactor body. The goal is to max out the power of this Vortex Force Reactor Body. The P.E.T. or Perpetual Electricity Turbine will be the insert in the middle, Although the method of power production is totally different than I first imagined I think that it is possible to get a minimum of four kilowatts using the best available technology. Well, things are beginning to take shape. The Vortex force reactors are no longer under a provisional patent. A regular patent application has been filed. This is the next step toward bringing this promising technology to the world. Also there has been movement in terms of how to market the idea. Remember that a while ago I told you that I had aquired the rights to use the name PET for the Vortex Force Reactors. In accordance with that I have purchased the domain name Electric.pet to use for one version of the Vortex Force Reactors. As of now that domain name points to this site. This version is designed to be sold in Pet Stores nationwide. Hopefully we can produce a version that stands about four and a half feet tall and about 30 inches wide. It should be capable of producing from one to ten kilowatts of electricity. The ideal way to market this version is in pet stores along with fish tanks. The vortex is the pet and the tank produces power. P.E.T. Perpetual Electricity Turbine. Thanks to a very good friend of mine I have acquired the rights to a pet name for the Vortex Force Reactors. I am going to call them simply that, a PET. The acronym stands for Perpetual Energy Turbine. My friend actually suggested that I call them Perpetual Electricity Turbines but, as one embodiment of the invention actually powers a water pump energy is a better term. Florida and 33 others states have Net Metering laws that require public utilities to purchase "Green" electricity back from customers at the retail rate. For most states that means solar power. But here in Florida hydro power is also included. That means that electricity produced by a Vortex Force Reactor can be sold back to the electric company. This fact is crucial to the success of the Reactors. For example a 20kw Reactor will earn 1,400 dollars at retail given a rate of $0.10 per Kw/hour. There are 720 hours in a 30 day month so at $0.10 per kw/hour each kw is worth 72.00 dollars a month at retail. In Florida the electric company will pay the retail rate up until the full amount of your electric bill. After that they will pay you the cost avoided or wholesale rate up until two megawatts. At wholesale a two megawatt Vortex Force Reactor will pay its owner 72,000 dollars a month given a wholesale rate of $0.05 per kw/hour. Accordingly I have designed a two magawatt Vortex Force Reactor that can be built for less than $175,000. My plan is to buy properties and develop them as Rational Recovery Houses while selling the electricty back to the power company. I will also be developing public power houses for under developed countries. I hesitate to sell these as the rich would only get richer. Sorry I have not posted in over a year. I was in prison. But while there it came to me. My original design was perfect. The problem was not in the design but in my desire to purchase all of the parts off the shelf. The best way to tap the full power of the vortex is from the bottom of the vortex not the top. This design will require a few custom made parts. First and most importantly it requires a submersible flywheel generator. As the water exits the hole between the two tanks it flys out due to centrifugal force. This power can be tapped by a simple turbine that should be able be bought off the shelf. It may not even require a submersible generator as the only problem will be that the water will be electrified if we don't use one. The turbine is attached to the flywheel generator and if my understanding of basic physics is correct it will keep accelerating until the friction of the ball bearings becomes too great or until the mass of the flywheel becomes so great that the flywheel explodes. That is the essence of E=Mc 2. Therefore it is essential that the flywheel be made out of a carbon fiber. That way if the mass becomes too great the flywheel will shatter instead of explode. Got the generator and my focus back on track. Thank you Jesus. Got the Motenergy Generator that I drew up in the previous blog entry. And I also had the custom impeller made. I tested the whole system a couple of times and the vortex collapsed down to the bottom of the impeller. I show the actual impeller that I had made in the video that I uploaded a couple of days ago. The video explains everything very well but the volume needs adjusting. Sorry. Since then I have found a fountain pump that pumps 800 gallons per hour while using only 60 watts. The generator produces four kilowatts. So now I have changed focus from building a working vortex force reactor that we have shown can and does work. Now I and am going to try the new pump and adjust the size of the hole between the top and bottom chambers. It may come down to having to build a larger set of tanks in combination with the faster fountain pump. I just think that the current set up looks cool. Finally figured out how to make the Vortex Force Reactor work. I have finally figured out how to make The Vortex Force Reactor work. After studying the Micro-Hydro-Generators that are out there it became apparent to me that there was a fatal flaw in the design that I had originally contemplated. You see when you start the vortex it streams down from the top and does not arise from the bottom. But, in all of the attachments to the Micro-Hydro-Generators that I've seen the attachment from the generator to the wheel has a big circular attachment in the middle. As I see it this will stop the vortex from forming. The solution is to put the generator in the bottom tank and send the shaft up from the bottom. Remember that in one of the videos I explained that what you see when looking down through the vortex is a hole that goes straight through to the bottom. Thus what needs to happen is for the generator to rest at the bottom of the bottom tank with a tiny shaft that goes up through the middle of this hole. And, we don't need a Pelton Wheel. What we need is a special turbine that will disrupt the vortex as little as possible. I have designed a turbine that is very simple but should do the trick. What it is is a small shaft with one crossbar at the top. The crossbar is very short. Actually the shorter the better. Using a generator like the one you see on this page there will be a long shaft long enough to get from the top of the generator shaft as it stands now while the generator is resting on the bottom of the bottom tank and go up through the hole between the two tanks. The single crossbar would look like the oar to a Kayak only the two paddles would be flat and in line with the shaft. The whole thing should be about two inches in length to maximize speed by being close to the Vortex. This new concept gives new life to the whole project and even though the original plans were published several years ago I have spoken to a lawyer who assures me that this new concept will extend my year deadline for a published patent to the date of this post or at least until the day that I first received the Reactor Body. I asked if I should still publish the information and he said that as long as I abide by this new deadline the patent can be obtained. I have been made aware of a company that makes special parts for Micro-Hydro-Generators and am going to contact them in the morning to price the construction of such a turbine. As the parts won't take much material I hope that the cost won't be excessive. Yet I may have to wait a while before testing the concept. Funds are low and there may be some issues with my lab space. As soon as I am able to have one built I will make arrangements for other custom made turbines so that you can get your own to build test Reactors for yourself. As I see it there is nothing stopping us from getting from three to four kilowatts from This particular Vortex Force Reactor Body using my new turbine design and one of the generators that you will find linked to the generator picture on this page. I have not yet added the solar powered pump to my test system. As soon as I do I will make the announcement on PRLog.com. But, all of the parts necessary to build the Vortex Force Reactor are available from Amazon.com. Are You Ready? The next step for me is to post the instructions for building one so that you can make one for yourself. As I want the directions to be as clear as possible I am going to take my time and write the instructions in Word then do some careful editing before posting the instructions. Today also starts my one year publication deadline for obtaining a patent. It is going to be costly but I do not intend to let this technology slip into the greedy hands of people who may not want this system to succeed. Should I not be able to get the patent, I would rather have this technology in the Public Domain than allow it to get squashed. Therefore if I do not make my one year deadline please feel free to build your own, on me. I will provide complete written instructions and video to help you make your own Vortex Force Reactor. I have made links to the Amazon.com pages where you can purchase the major parts. Feel free to use the instructions that I will post to build your own. And, please purchase the parts from the links on this page. That way at least I'll make four to eight percent commission as an Amazon Affiliate. Now that we have successfully created a sustainable water Vortex Reactor it is time to extract electricity from the System. To my surprise there are quite a few different off-the-shelf products already in existence that will allow one to produce electricity immediately from the Vortex Force Reactor. Here are some of them. To my mind the Vortex Force Reactor acts just like a power line transformer or power booster. In order to get the most power out of the Reactor it makes sense to use a flywheel generator to transform the liquid power of running water into a solid state that can be tapped at will. I'm pretty sure that the perfect Flywheel generator can already be bought off-the-shelf or made from a water pump turned generator. Going to check that out soon. But this report is a good update. For books on how to tap running water and turn it into electricity Please visit: The Good Works Shop, Amazon.com Affiliate store. Always wear Rubber Gloves and Rubber Boots when working with Electricity and Water. Vortex Force Reactor test success. Shortly after receiving the Vortex Force Reactor body I wasted no time in testing out the theory. I did. And, it works. I thought that to make any money with this thing I would have actully make it produce electricity. No Such Thing. A vortex is a beautiful thing to behold. As such it makes sense that people would want them just for their beauty. If you look at the test vortex you will see how simple it is to create. But I"m like Microsoft: Plug and Play. So, as soon as posible I will put the Vortex Force Reactors together for you to simply ad water and plug in. Please watch the video on the Vortex Force Reactor home page. The body of the Vortex Force Reactor arrived this morning by UPS. It is a bit smaller than I expected but it looks like it will do the job. As soon as I get the other parts I need I will start working on the electrical part of the invention. I filmed the arrival but I must apologize for the sound quality, I forgot to adjust it after playing some loud music. At least I did get some real live footage of its arrival. Historic. Now to get it to work. In theory it will work, but theory is a long way from actual performance. I have seen one patent that proves that my theory is correct. That patent however simply created a vortex in a vacuum, what I am doing is tapping into my vortex and creating electricity as cheaply as possible. Welcome. I finally made budget concessions enough to purchase the body of the Vortex Force Reactor. The body of the reactor is perfect for our purpose: Clear, two chambers, and most of the holes we need between the two chambers already there. Buckminster Fuller would be proud. According to Bucky it is better to take devises that are already available and modify them before you go ahead and duplicate efforts. The body of our reactor is actually a water purifier that I found while looking for water coolers at Amazon.com. As an Amazon affiliate I will earn anywhere from 4% to 8% commission from the sale of these Vortex Force Reactor Bodies. The nice thing about this purchase was that it was on sale. I mean really on sale!! !